Wife of the President, Mrs. Aisha Muhammadu Buhari has restated the commitment of Future Assured Programme to the core values of partnership, accountability and alignment to national priorities in its mandate of improving the health and well-being of women and children as well as the vulnerable in Nigeria. She made this commitment through Senior Special Assistant to the President, Dr. Hajo Sani, at the just concluded World Village Festival in Helsinki, Finland. She highlighted the Get Involved Initiative of Mrs. Buhari, as a very successful intervention, which has generated a lot of goodwill among national and international players to address the issue of nutrition, in pregnant mothers and young children, including those in displaced persons camps. Mr. Meijo Mikkanen, Secretary, Africans and African Europeans Associations (AFAES) in his response, commended Nigeria’s anti-corruption fight and hoped that Nigeria will work with the Universal Peace Foundation to make better gains in that regard, saying that “to uphold and practice righteousness and noble responsible lifestyle in corrupted circumstances is challenging indeed”, that success in this area will not only be rewarding but even liberating for Nigerians. He commended wife of the President’s effort to improve the living conditions for women and children with the hope that Nigeria will make a difference in that regard. 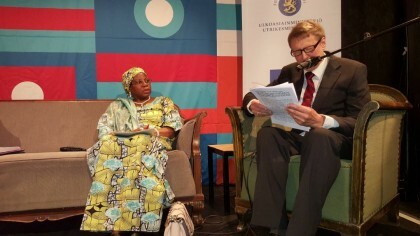 He called for improved working relations between Nigeria and Finland. The programme was organized by the Finland’s Development Agency KEPA with a view to promoting global sustainable development using the exemplary models of strong social welfare as achieved in all Nordic countries. Some of the Key persons at the discussion were Mr. Abayomi Magbagbeola, General Secretary Nigeria-Finish Association, Mrs. Jane Ada Ndem, Head of Mission at the Embassy of Nigeria in Stockholm, and Dr. Kingsley Akinroye, Honorary Consul of Finland in Nigeria.